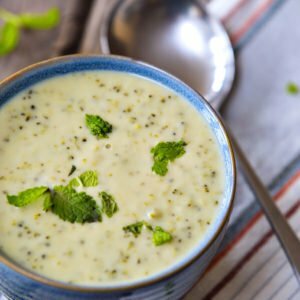 Homemade Creamy Cheesy Broccoli Soup is so rich and creamy. It’s perfect for fall and winter! Add the broccoli, onion, garlic, carrots, bay leaf and chicken broth to a pot. Bring to a boil, then reduce heat simmering for 15 minutes. I have the lid half on the pot so steam can escape a little. When you have about 5 minutes left of the broccoli mixture start the cream sauce. In a large pot over medium heat, melt butter and add flour. Whisk together while it cooks for 3-4 minutes. When your veggies are done, slowly pour in just the liquid from the boiling vegetables. It’s totally fine if a few veggies slip inside the pot. Wisk quickly as soon as the liquid hits the butter/flour mixture. After that thickens a little add in the vegetables, half n half and dash of garlic salt. Mix slowly until heated though. Remove from heat and add in shredded cheeses. Then add salt and pepper if you think it needs it. Freezing Directions: Prepare soup as directed above and allow to cool. Divide into quart or gallon freezer bags, label, and freeze. To serve: reheat on stove top or microwave until heated through. Enjoy.